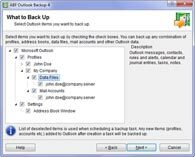 Outlook Backup is software program to synchronize and transfer Microsoft Outlook. The program allows users to synchronize Microsoft Outlook between several computers, Windows users and operating systems. Outlook synchronization process is fast, simple and even may be done automatically using Task Builder. Outlook Backup enables users to synchronize and export Microsoft Outlook mail client between computers, users and operating systems. You are able to synchronize all important Outlook data, including email messages, address book contacts, accounts, message rules, junk email lists, settings and signatures. Synchronization of Microsoft Outlook becomes fast, simple and is easily done in 3 steps using Outlook Backup . First you need to backup all the data on the first computer you are going to synchronize. Secondly, copy resulting backup file (*.OB4) to another computer using some media or network connection. Finally, install Outlook Backup on the second computer and restore your data from the backup file you've just moved. See picture below. You can synchronize Outlook automatically using a scheduler feature of Outlook Backup. Run the program and follow the wizard to backup Outlook. On Where to Back Up step select a location that is accessible from both computers you'd like to synchronize Outlook. On confirmation step, click Advanced button. Skip all the steps until you are on When to Back Up. Select Later option and configure the scheduler. When you're done click Next to complete the backup wizard. On the second computer, follow the wizard to restore Outlook. On What to Restore step select the backup file you've created before. On confirmation step click Advanced button and configure the scheduler just like it is stated above. Click Next when you're finished to complete the restore wizard. Note: Outlook Backup does not merge but overwrite Outlook data on restore.